A new page has been published in the story It Came from the PULP-O-MIZER, at Thrilling Tales of the Downright Unusual. It pleases me no end to say that LoneStarCon3, the host of the seventy-first World Science Fiction Convention, has decided to conspire with me in a Pulp-O-Mizer cover competition. Anybody who has registered for the 2013 Worldcon in San Antonio, Texas can enter. There’s a special "WorldCon #71" title image that only the contestants can use, and which they must use in order for their entry to be considered. Entrants can unlock the super secret WorldCon title by following the instructions on the competition’s page. Entries are being accepted through May 31st. 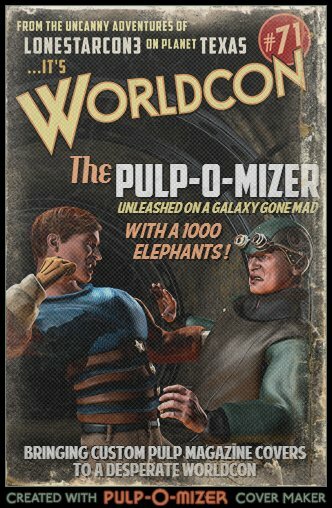 So if you’ve registered for WorldCon… go forth and Pulp-O-Mize! And if not, why not? 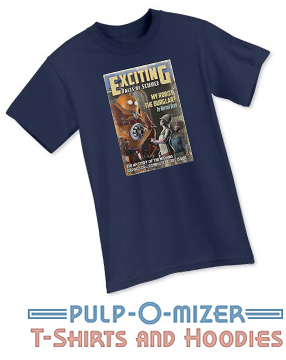 I’ve been experimenting with the process for offering T-shirts and hoodies through the Pulp-O-Mizer. At the moment, I’m cautiously optimistic. Supporting T-Shirts requires some more muscle from the server. I’m not sure yet whether that will amount to too much muscle, especially under the heavy load that the Pulp-O-Mizer sometimes attracts. It’s a sturdy contraption, but it does need to co-exist with other contraptions on the same shared server. So we’ll just have to see. Yesterday’s work went faster than I expected – which is as nice as it is unusual – and the next step at least doesn’t require me to be any smarter than I have been up to now. The final, or penultimate, or semi penultimate step, though, will take smartness on a grander scale. And then, with my smartness expended, I’ll have to see how many resources the whole process requires from the server and reduce that load, if I can. It’s so thrilling, in fact, that I keep meaning to chronicle all the highlights of the past few weeks. But I’ve been too busy! At first I was patching up all those parts of the Pulp-O-Mizer that weren’t quite ready for the public when the public, suddenly, poured in; then I had to catch up on some other work; then I added a few new image layers; and now I’m working on The Question Of Shirts. So the True Life Story of the Astounding Adventures of the Pulp-O-Mizer may have to wait so long that I won’t remember what it was any more by the time I sit down to type it up. All in all, that’s not a bad problem to have.